The patent landscape may be only slightly altered in the wake of the Supreme Court’s decision in Alice Corp. v. CLS Bank, but it’s been altered in fairly significant ways, according to several IP attorney experts interviewed by Technology Transfer Tactics. What’s patentable remains largely the same, but the ruling did offer some important clarity on the critical issue of subject matter eligibility, and how claims are drafted may need to change, the attorneys say. For now, that ruling and follow-up guidance mean this for TTOs: “Review new software and business methods to identify whether an invention is merely a computer implementation of a well-known algorithm or process,” advises Molly S. Lawson, a partner at Michael Best & Friedrich LLP, Milwaukee. If it is, she adds, “TTOs should consider whether there are any aspects of the invention that improve the functionality of the computer — such as increase its speed or reliability — or the previous implementations of the algorithm or process.” If so, consider documenting the improvements in the detailed description of the patent application and draft claims that focus on the improvements. “TTOs should also consider drafting claims relating to software and business methods with a more application-specific focus,” she says, such as the specific interfaces created using the software, the other software or hardware components that the computer interacts with, or specific interactions with users. 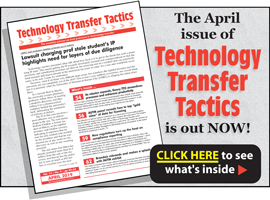 A detailed analysis of the Alice Corp. ruling appears in the July issue of Technology Transfer Tactics. To subscribe and access the full article, as well as the publication’s subscriber-only eight-year archive of best practices and success strategies for TTOs, CLICK HERE.